Full length portrait of two boys with their arms round each other and ash marks on their bodies and hands, with two youths beyond them, looking away to the left out of frame. The nearest youth has his hair plastered into a 'horn' with ash as part of the dying and straightening process. Note on print reverse ms pencil - "44 3 A109" & print front border ms ink - "NUER X/32"
Morton, Chris. 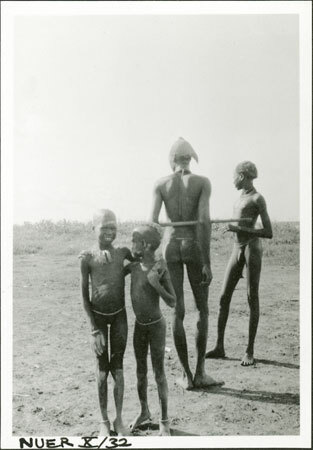 "Portrait of Nuer youths" Southern Sudan Project (in development). 03 Jan. 2006. Pitt Rivers Museum. <http://southernsudan.prm.ox.ac.uk/details/1998.355.464.2/>.